"Sampath Speaking" - the thoughts of an Insurer from Thiruvallikkeni: Human error and rain intervention sees WI qualify !!! Human error and rain intervention sees WI qualify !!! Scotland were 105-4 in the 32nd over when Windies off-spinner Ashley Nurse rapped Berrington's pads and umpire Paul Wilson raised his finger after lengthy deliberation. Berrington was unable to review, with the International Cricket Council electing not to use the decision review system in this tournament. 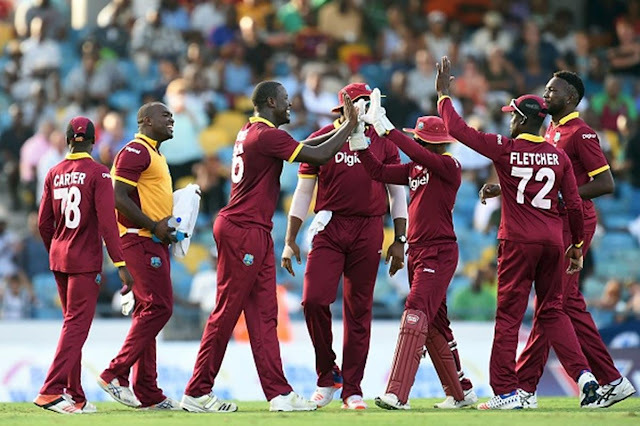 Earlier, the Scots made a sensational start when the excellent Sharif (3-27) had Gayle caught behind with the first ball of the match, then removed Shai Hope in his second over. Doubt why you are reading this ?? I remember that Clive Lloyd tour immediately after the World Cup 1983 which Kapil Devils won – the 4th Onedayer at Keenan stadium, Jamshedpur in Dec 1983 – Chetan Sharma made his debut. Those were days when 250 was a match winning total and WI went on to make 333/8 in 45 overs with contributions in tons coming from Gordon Greenidge and IVA Richards. Such was the total dominance of West Indies those days ~ and it is hard to digest that it took a human error and help from rain enable them qualify for the World Cup. It usually rains on around 191 days a year in Edinburgh, where Scotland play much of their international cricket. Harare Sports Club sees, by comparison, around 73 rainy days a year, and one of those days brought a soggy end to what was shaping up to be a thrilling match between West Indies and Scotland. Chasing 199, Scotland were 125 for 5, five runs behind the Duckworth-Lewis-Stern par score, when the rain came down. The result means West Indies have booked their place in Sunday's final, and thus the World Cup in England next year. Eventually, the West Indies simply seemed like undeserving beneficiaries of two lucky breaks, one courtesy a human error and the other through nature’s diktat, as they booked a spot at next year’s World Cup at the expense of a devastated Scotland team, who for most parts of the day looked all set for a fourth World Cup appearance. For, if Scotland had lost one less wicket at the point a heavy drizzle turned into a mini-storm and forced the players off, they would have been ahead by three runs on the Duckworth-Lewis-Stern (DLS) method and therefore been adjudged winners. Instead at 125-5 in 35.2 overs, they were five runs behind. Scotland's hopes of reaching the 2019 World Cup are effectively over after West Indies won a rain-affected game in Harare to qualify for the tournament. The Scots needed another 74 off 14.4 overs when the deluge intervened, Kyle Coetzer's side trailing by five runs on the Duckworth-Lewis-Stern (DLS) method. They had earlier bowled the Windies out for 198, Safyaan Sharif and Brad Wheal both taking three wickets. Richie Berrington hit 33 after Scotland were reduced to 25-3 in reply. But his controversial dismissal, given out lbw to a ball that replays appeared to show was heading down the leg side, proved costly as Scotland's hopes of a fourth World Cup appearance - after reaching the 1999, 2007 and 2015 tournaments - were ended by the weather. Zimbabwe will take the second and final qualifying place if they beat UAE, who are already eliminated, on Thursday. A shock defeat for the hosts would see the winner of Ireland against Afghanistan on Friday go through. More Cricket shock – elsewhere downunder in the 1st Test (D/N), England tour of Australia and New Zealand at Auckland. England have been bowled out for 58. Ben Stokes made his return to Tests, albeit largely as a specialist batsman amid concerns regarding his workload and fitness for the longer format. He missed the Ashes, which England lost 4-0, due to a police investigation after his alleged street brawl in Bristol. England captain Joe Root also confirmed he will move up to No. 3, which meant James Vince was dropped after a sub-par Ashes. Overton finished the highest and perhaps has the highest individual proportion of an innings as the scorecard of Cook, Stoneman, Root, Malan, Stokes, Bairstow, Ali, Woakes, Overton, Broad, Anderson reads : 5,11,0,2,0,0,0,5,33,0,1. Trent Boult has figures of 10.4-3-32-6; Tim Southee 10-3-25-4.